Apparently shooting a Texas motorcyclist in the thigh during a high-speed chase wasn’t enough for one state trooper, who ended up performing a leaping kick into the man’s lower body after eventually pulling him over. The incident began after then-25-year-old Steven Gaydos ran a stop sign in Texas’ Chambers County. The case actually occurred back in December 2012, but only surfaced recently after the Austin American-Statesman newspaper conducted an investigation into how cops deal with fleeing suspects. The chase was captured by Texas Department of Public Safety (DPS) trooper Abraham Martinez’s dashcam as he raced behind Gaydos, yelling at him to pull over. Speeds of 130 miles per hour were reached during the chase and at one point, Martinez took out his gun and shot it four times in Gaydos’ direction. Martinez said he was only aiming to “disable” the motorcycle, but he ended up striking Gaydos in his right thigh with one of the bullets. Eventually, Gaydos could be seen slowing down as he reached an intersection and decided to pull over. 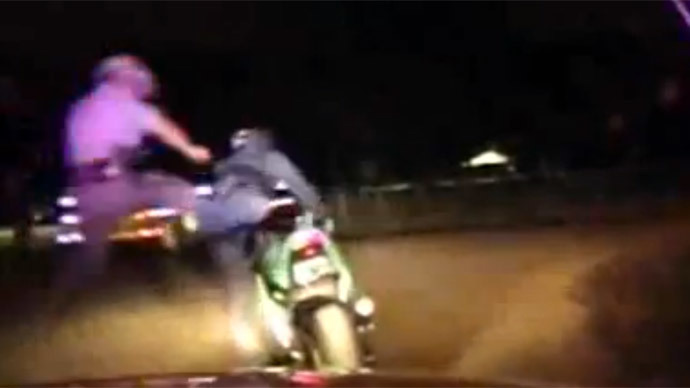 However, as he tried to dismount from the bike, Martinez is seen jumping in the air towards him and kicking him in his left thigh. Gaydos was taken to the ground and arrested. He was charged with evading arrest, driving with an invalid license and possessing two Percocet pills, the Statesman reported. Gaydos said at the time he knew the police were chasing him, but claimed he didn’t want to lose his bike because of a suspended license. He also questioned whether it was necessary for Martinez to shoot him. Martinez was questioned following the incident and claimed he shot at Gaydos and then kicked him off his bike because he believed the suspect was involved in some sort of crime. “Past experience has taught me that people evade arrest to conceal their identity after committing felonious crimes to include but not limited to, murders, aggravated robberies, sexual assaults, burglaries, and/or the vehicle utilized to evade arrest is stolen,” he wrote regarding the incident, according to documents from his personnel file. The DPS maintains officers will have to use deadly force against those fleeing on some occasions. “Once a driver makes a conscious decision to evade law enforcement they are automatically committing a felony offense and endangering the public,” DPS spokesman Tom Vinger told the newspaper.